Thorlabs SM2 Tube System parts including the SM2NFM2 Nikon F-Mount adapter. The Thorlabs SM2 lens tube system is designed for optomechanical lab set-ups. I put this set of parts together to make a flex and vibration free setup to mount special lenses for macro photography. This system should be more rigid than the system I am using now and a lot easier to setup and use. Scanner Nikkor lens with and without the Thorlabs SM2 52mm threaded sleeves. Thorlabs SM2 tube couplers make a very convenient way to mount the Scanner Nikkor when fixed to the lens. The threaded collars will make mounting the Scanner Nikkor and setting the magnification ratio quick and easy. The male 2.035-40 threads are compatible with female 52mm x 0.75 threads. I used SM2 couplers on both the front and the rear of the Scanner Nikkor. The front 52mm x 0.75 threads will make it easy to mount a hood or to mount the lens in reverse. Thorlabs SM2 system parts with Scanner Nikkor lens. The SM2NFM2 Nikon F-Mount adapter at the rear with SM2 tubes with mounts, and the Scanner Nikkor lens mounted with SM2 couplers and a SM2 tube at the front being used as a lens hood. This is just a quick check of the parts, the tube mounts are not fixed to the quick release plate at this point. 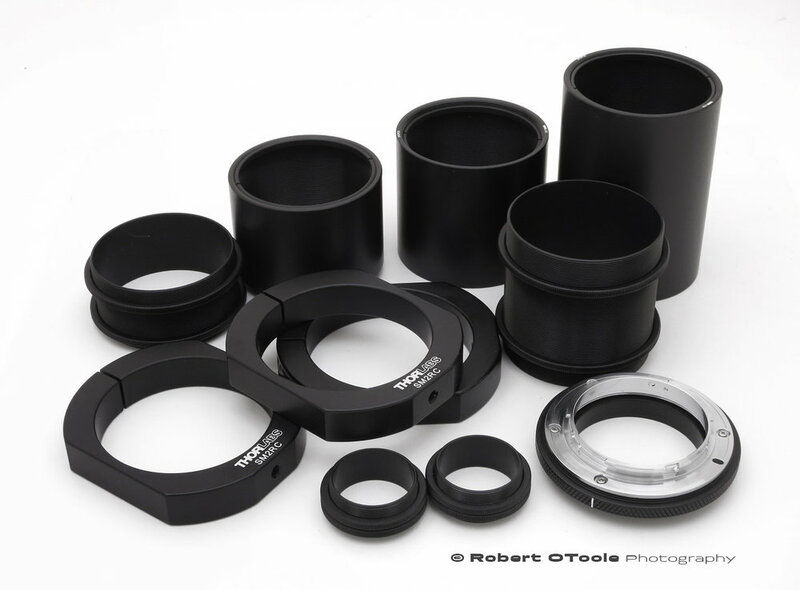 Thorlabs makes 42mm, 49mm, T-mount > SM2 adapters so mounting other lenses to this system should be clean and uncomplicated.